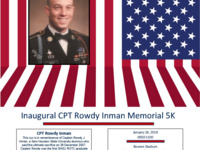 This run was established by the Department of Military Science in remembrance of Captain Rowdy J. Inman, a Sam Houston State University alumnus who paid the ultimate sacrifice on 26 December 2007. Captain Rowdy was the first SHSU ROTC graduate to die in the War on Terror while he was with the US 3rd Armored Calvary Regiment out of Fort Hood, TX during Operation Iraqi Freedom. Captain Inman was also a veteran of Operation Desert Storm and Operation Just Cause, earning many accommodations including the bronze star with oak leaf cluster, the Purple Heart, and the meritorious service medal with oak leaf cluster. While at SHSU, Captain Inman earned his Bachelor of Science in Military Science in 2000 and commissioned as a 2nd Lieutenant that May.